Nothing shows off the peaceful nature of Jeju like the Olle trails. Walking along these paths allows us to relax, slow down from our busy lives, and reflect upon our past and our future. 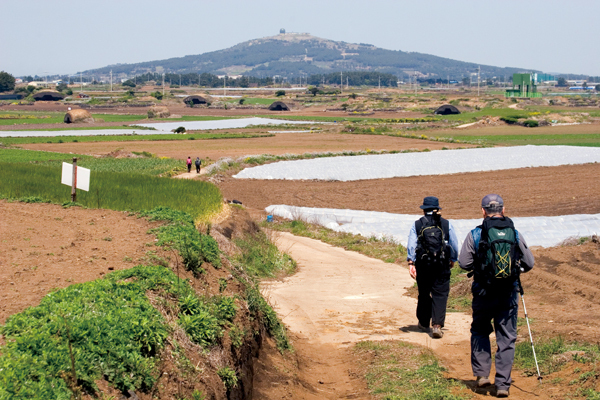 Olle trail 11, which leads from Moseulpo Harbor to Mureung, follows the dark side of Jeju’s history. 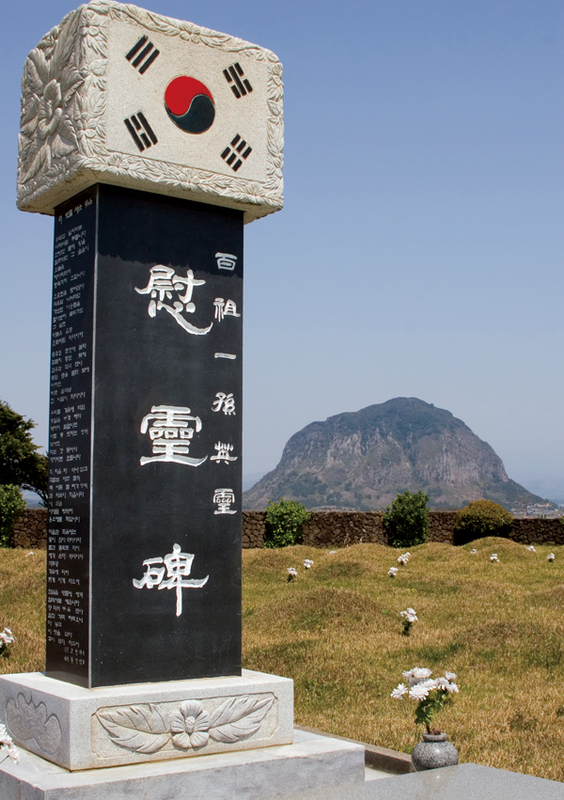 On this trail, three symbolic sites of Jeju tragedies can be found; occupation, political massacre and religious suppression. Olle trail 11 takes an uncharacteristic turn away from the ocean and stays mostly inland. It is not a long walk before you’re away from the town of Moseulpo and into the local farmlands where farmers still till their fields and harvest their crops by hand. As we walked through the outskirts of Moseulpo the people were busy at work, digging potatoes out of the ground, one by one. It seems like backbreaking work, but you only understand real back breaking work when you look at where their equipment is stored; a concrete airplane hangar. Alddreu airfield was completed towards the end of World War II, during the Japanese occupation of Korea. As they were losing the war and being pushed back towards their homeland, Jeju Island was a strategically important location to defend Japan from the Americans. The Japanese shipped some 70,000 soldiers and forced the Islanders into hard labor. Not only were these people forced to construct this massive airport, but also artillery stands, trenches, and tunnels. The remains can still be seen to this day. As the trail traverses the airfield, we arrived at a site of political tragedy, Seotal Oreum. In 1950, after the Korean war broke out, the Korean government issued orders of “preventative detention” of suspected communists and communist sympathizers. Of the 344 people the Moseulpo Police detained, 210 were illegally massacred in two mass killings at the base of Seotal Oreum. “The executed were all kinds of suspected people; prison guards, principles, teachers, communists and innocents,” Kang said. Seotal Oreum looks peaceful today, but of those 210 bodies 40 have still not been recovered. Some locals say that during the rainy season, bones and artifacts can still be found. “It was an obvious crime,” he said. As the trail heads towards Sinpyeong village, the grave of Jeong Nan Ju Maria represents religious suppression in Korea. According to "Sources of East Asian Tradition," by Wm. Theodore de Bary, Catholics were severely persecuted throughout Korea during the Joseon dynasty. In 1801, the government started to arrest and execute Catholics who would not renounce their faith. Kang said that Catholic Hwang Sa Yeong wrote a secret letter intended for the Bishop, Alexandre de Gouvea, in Beijing. The letter was intercepted and Hwang was executed. The sign at the site reads that his family was separated and exiled on various island. Their young son, Gyeng Han, was left on Chuja Island and, Jeong Nan ju Maria, was exiled to Jeju. “Jeong Nan Ju Maria tomb, which was built by [the] Korean Catholic Church, honors her piety and sanctified it as ‛Daejung Sanctuary’,” Kang said. As the trekker nears the end of the Olle trail, walking through the beautifully enchanted Gotjawal forest, the memories of the past linger. The Alddreu airplane hangars seem peaceful and beautiful surrounded by farms. The mass graves at Seotal Oreum are now covered in concrete. 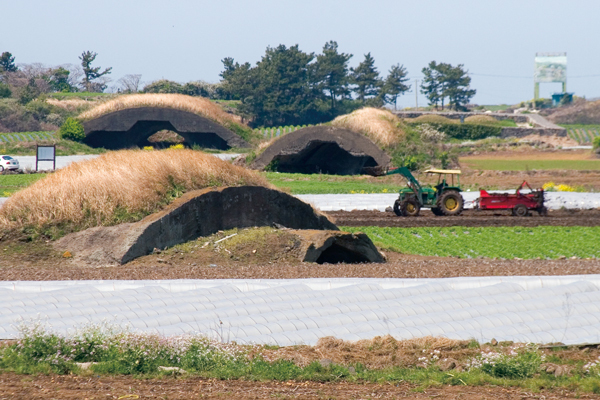 It’s difficult in the modern world of travel to imagine the beautiful tourist mecca of Jeju as a place of exile.